August 15, 2014 · by Zack Reyes · Post may contain affiliate links. See my disclosure policy here. If you're looking for the most powerful blender you can buy, you've found it! 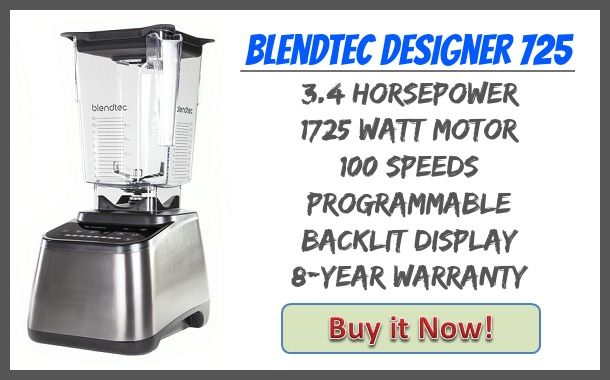 The Blendtec designer 725 series pack a serious punch at 3.4 horsepower and 1725 watts of pure power. If you want something blended right, this is your best bet. When people say "restaurant quality", they are talking about a blender like this. In fact, I've worked in restaurants that didn't even have blenders this nice, and they paid a lot more for them! This blender comes with a whopping 8 year warranty. It's nice to see a blender company stand by their products like this. Having an 8-year warranty on the most powerful blender in their line is a really nice statement. This thing is BUILT TO LAST. Blendtec offers a payment plan for this blender. When checking out, you can opt to pay half now. You then pay half of the remaining amount the next month and pay the rest the month after that. This takes away some of the sting up front. Pore power baby! This is the most powerful blender you can buy, so you should expect to pay a premium for it. This really is the best of the best and it shows in every facet of this blender. Another feature is the SmartBlend technology which senses and identifies potential problems that could interfere with the perfect blend-including loading errors, overheating, or air pockets - and then tells users how to fix them. If this blender is just simply out of your price range, I encourage you to take a look at the Blendtec refurbished classic blender for only $279.95 with free shipping! This thing still comes with a 7-year warranty, just as if you bought it brand new! Still just a little bit out of your price range? The CleanBlend 3 HP blender gets extremely high reviews on Amazon and is only $199.99. Get it here! I definitely encourage you to check out the most powerful blender available - the Blendtec Designer 725. With over 1700 watts of power and a reach of 3.4 horsepower, it's well worth the investment and will be an appliance that stays with you for a very long time. Buy it today, and don't forget about the payment plan option and the solid 8-year warranty!